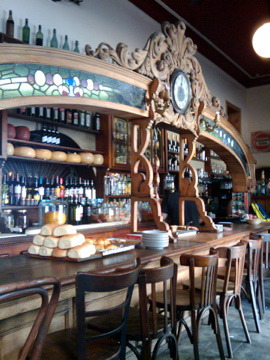 Have some tea and cakes at historical tea house Las Violetas in the location of Almagro before heading to the nearby Centro Cultural Konex for the 7 PM Monday classic, La Bomba del Tiempo. This outdoor percussion orchestra is guaranteed to get your feet tapping and arms swinging in a unique rhythmic experience. Visit the Rosedal, a beautiful rose filled park where you can take a stroll or pedal a boat on one of the lakes. Don’t forget to check out the Museo Sivori in the back where you can find a small collection of Argentine art. Later in the evening starting at 10.30PM live jazz and tarot readings at Centro Cultural Matienzo. In the evening head out to Uni Club to the Latin Jam party where you can move to jazzy latin rhythms! The Xul Solar museum is a place filled with the rich imagination of this playful, symbolic and colorful artist. Guided tours are offered at 4pm. In the evening head to Thelonious Bar for drinks featuring live jazz music at 9.30PM by Marina Quiroga. Head to the MALBA and check out Grete Stern’s ‘Dreams’, a series of vintage photomontages done by German/Argentine designer and photographer Grete Stern for the Argentine magazine “Idilio” to illustrate the dreams of readers for a segment dedicated to psychoanalysis. 7th Tattoo show- A gathering of tattoo artists, for the daring. A large fair in Plaza Francia where the best local artisans display their array of leather, metal, and woven goods. A great place to shop and browse after visiting the Recoleta Cemetery. A wonderful collection of antiques, odd objects and surprising finds! The Market is located on Dorrego and Niceto Vega.